In my last post, I discussed how a coach typically selects players and builds a team. Although the article was directed toward sports parents, players should also understand how they are evaluated by coaches. By knowing what a coach is looking for, players give themselves the best chance to make a team, get more playing time, and possibly go from being a backup to a starter. One of the most important points I discussed was that a team's success largely depends on different players playing different roles well. Why? Because teams rarely consist of players who are each capable of playing every position and team role. Absent great all-around players, achieving success instead becomes an exercise in matching certain players to certain roles. Most teams need to leverage their players' individual strengths while hiding or minimizing many of their weaknesses. With the right mix of players, the whole can become greater than the sum of its parts. This reliance on roles to achieve team success is what provides many opportunities for lesser athletes with limited skill sets. It can help open your door to success in sports. So let's take a quick look at how you go about finding your possible team roles. What strategies and tactics are favored by my coach? What roles are needed within this style of play? As you consider each of these questions and formulate your answers, try to see where the answers overlap. This is where you will find your best opportunity for success. For instance, in football, a coach may prefer a run-first version of a “spread” offense. In contrast to a “pro” offense that requires a quarterback who is an excellent drop-back passer, this spread offense needs a quarterback who is first a good runner. Likewise, it may require more mobile lineman. The emphasis is placed on lineman who are quicker, have good feet, and can get downfield or to the outside to block their opponent. In this case, size and strength are less important than speed and agility. Now, where would you and your unique set of characteristics possibly fit in the above example? 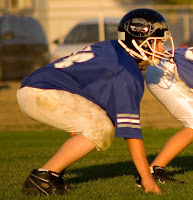 If you do not possess good hand-eye coordination or outstanding size and weight—but you’re quick, intelligent, and like contact—you might target playing the offensive line position in a spread offense. Of course, the ideal setting that best matches your abilities may not exist. (In the above example, your high school's football coach may run an offense that's based on a more traditional power-running game.) But you should try to understand where your unique attributes best fit in and whether a certain position or role is one that you would possibly enjoy playing. TIP: Each coach has a unique view on what mix of players, strategies, and tactics best leads to success. To help you better evaluate and understand where you possibly fit in, don’t hesitate to ask your coaches where they believe your opportunity lies. TIP: When you apply the above approach to all of the sports available to you, the possibilities expand for you to find the right role within the right sport. Excelling in a defensive team role is an avenue to success for many young players who may have limited sports skills—especially in smaller schools with fewer athletes. This role is one that depends to a large degree on a player's desire, hustle, focus, and other attributes related more to the mind than the body. A good defender is appreciated in virtually every team sport and by most coaches. In high school, I played varsity basketball for a coach who preferred an aggressive man-to-man defensive scheme. He appreciated players who hustled and could defend their man well. My junior year, having only limited offensive skills, I always focused on playing excellent defense—both in practice and in games. I wanted to shut down my opponent. This defensive role was the one in which I could contribute to my team, get more playing time, and eventually would leverage to become a starter. In my next article, I'll talk more about team roles—both the primary and secondary ones that can provide you with your opportunity for success.